Northern Namibia is one of the best places on the planet to spot large animals. Hippo, crocodiles, ostrich and zebra all flock to the watering holes here. 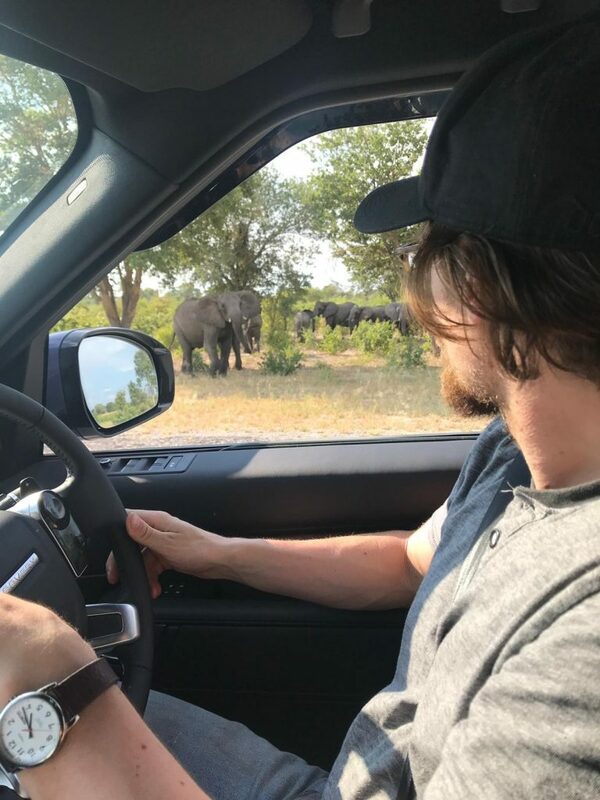 Elephants are also quite common, and we were lucky enough to see some out the windows of our Land Rover as we drove the six hours from Rundu (a large city in northern Namibia) to Katima Mulilo (on the border with Zambia). We were accompanied on this leg of our journey by our colleagues from UNAM, Professor Davis Mumbengegwi and his graduate students Munya Tambo and Whitney Shigenge. Davis, Munya and Whitney are based at the main UNAM campus in Windhoek, some nine-hours drive south, so you might be asking why have they driven all this way to teach us about malaria in the north? The answer lies in the physical and human geography of the region. The very things that attract large animals to the north of Namibia (high rainfall and wetlands) also bring smaller animals – namely mosquitoes – and in large numbers. Anopheles mosquitoes are the vector for malaria parasites and the size of their population is a key determinant of the intensity of malaria transmission. The relatively high rainfall also attracts another medium-sized animal: humans. Namibia is the second least densely populated country on the planet (after Mongolia), but over three quarters of the population live in the northern half of the country, leading to a critical mass of people to sustain malaria transmission. This is partly because of the vast expanses of arid desert in the south of the country, which George mentioned last week, that make the land inhospitable. 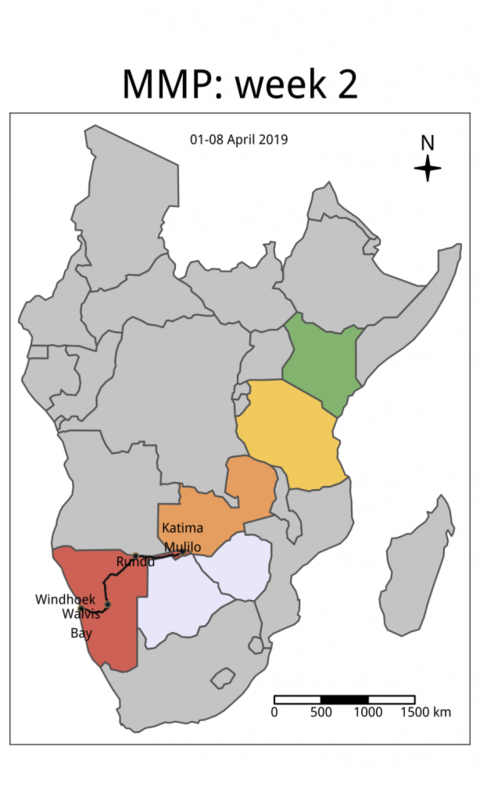 Add to this a very long, porous border with Angola, which experiences higher levels of malaria transmission than Namibia, and the situation creates ideal conditions for malaria to thrive. Another of Prof Davis’ students, Tanga Kashupi, has worked here in the north over several years and she told us how the political geography further complicates the issue; southern Angola is comparatively devoid of services, so many Angolans seek healthcare in northern Namibia when they get sick and it is not uncommon to encounter people travelling tens of kilometres to receive care in Namibia. Little wonder that the World Health Organization notes that malaria is largely confined to the border region in the very north of the country. Complicated, cross-border issues like this highlight the importance of international initiatives like Elimination 8, as George mentioned last week. Fortunately, inspirational people are doing exciting work up here to try to shrink the malaria map, and Prof Davis is at the heart of the effort. In last week’s article, George mentioned Munya’s work utilising genetic ‘fingerprints’ to identify imported malaria, and Whitney joined us in the north in the hope of finding plants used by traditional healers, which she will screen for antimalarial properties back in the laboratory (artemisinin, the current global first-line antimalarial, was discovered in a similar way). Equally innovative work is going on within the Ministry of Health – in Kangoro village in the Zambezi region we met Martin Kadiwendi, a nurse who is the only clinician at a health centre serving almost 4,000 people living nearby. A few days earlier, he had diagnosed a young woman with P. falciparum malaria, and notified the Ministry of Health using his government-issued computer tablet. 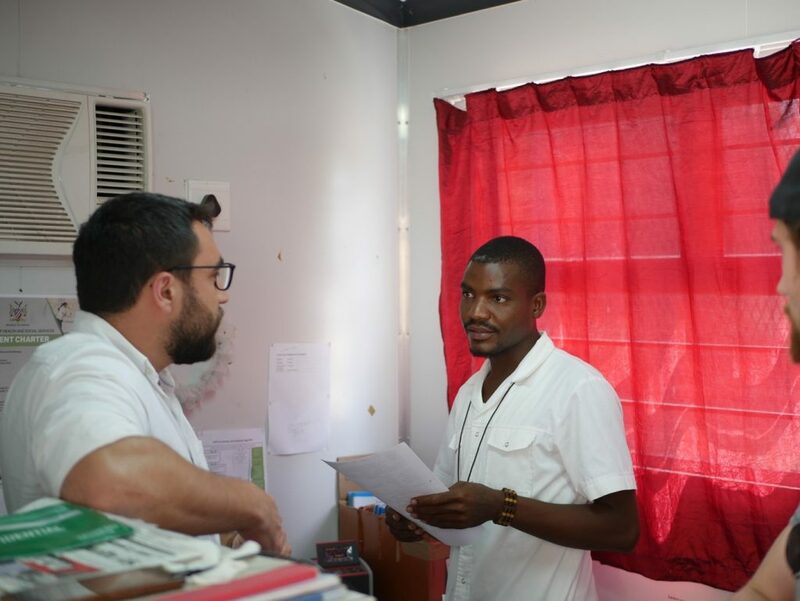 Martin showed us around his clinic: we saw the filing cabinets where he keeps the records for his 300 or so patients with known HIV, and the meticulous records of every malaria case. In one room he delivers babies and keeps a large fridge to store the vaccines he will give them; another houses his supply of antibiotics, anti-epileptic medications and drugs to lower peoples’ blood pressure. In a converted shipping container outside the main building, he manages multidrug resistant tuberculosis, diarrhoea, heart disease, pneumonia, malnutrition and anything else that the 60 patients that come through his doors on a daily basis may present with. With this large and undifferentiated patient load, his knowledge, care and attention to detail was impressive. We arrived at Martin’s clinic around the same time as Astrid Agusto, the surveillance officer for Kavango East region and a former graduate student with Prof Davis. They were about to conduct some reactive case detection: when someone is diagnosed with malaria, health officials here trace everyone who lives within 100m of the known case and test them for malaria, offering treatment to anyone who tested positive. Together, we set off for the village where the index patient had lived. It was a Friday afternoon but the searing heat and the dusty, bumpy road did not deter Martin and Astrid from setting up a mini clinic under a tree outside her homestead. They convinced everyone living there to come out and get tested, and, with good humour and practiced efficiency, tested the nine relatives living in the compound before moving on to the neighbours. Fortunately, on that day, no-one was positive. 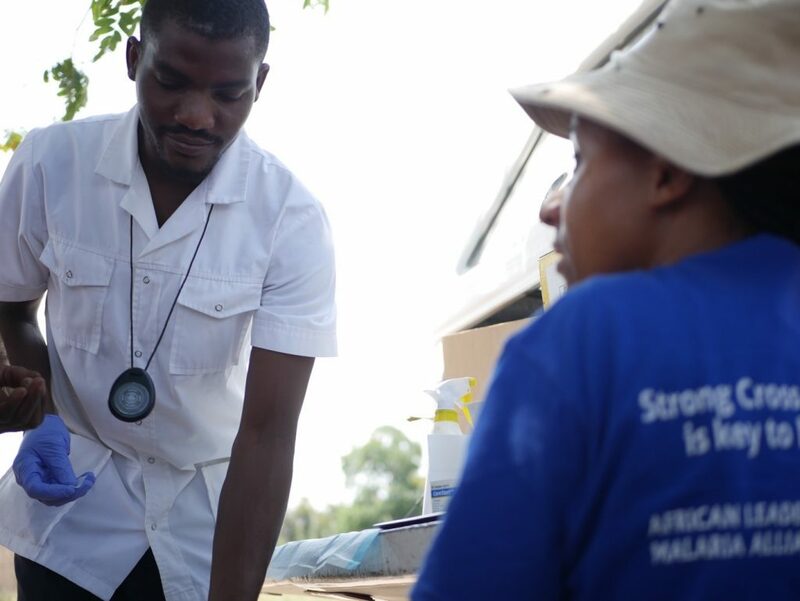 The relatively low transmission of malaria here in Namibia is testament to the tireless effort of healthcare workers like Martin, public health officials like Astrid, and researchers like Munya, Whitney, Tanga and Prof Davis. In fact, malaria is now so uncommon in Namibia that the tourists who flock to see Etosha’s large animals are not advised to take anti-malarial preventive tablets when in the southern part of the country. With the continued efforts of the smart, committed, hardworking people we met here, I hope and trust Namibia’s progress in malaria control can continue. Great work guys and thanks for your hard work which has enabled us to learn what is happening in other Countries. As a Zambian fingers crossed we beat malaria to zero by 2021 so that your sacrifices are not in vain.